With rich industrial experience and knowledge we are involved in 0ffering a wide gamut of Indoleacetic Acids. This is mainly a heterocyclic compound that serves as a phytohormone called Auxin. Offered Indole Acetic Acids promotes the formation of roots in plants. In addition to this, these are well known due to their effective results and are available in market at very feasible prices. 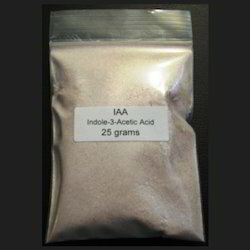 Looking for Indoleacetic Acids ?